One of the leading causes of minor flooding and water damage in homes. Routine maintenance can prevent many of these extremely disruptive occurrences. While the most common cause of sewer blockages outside the home can come from root systems penetrating the pipe, age and/or pipe material can also be the cause. 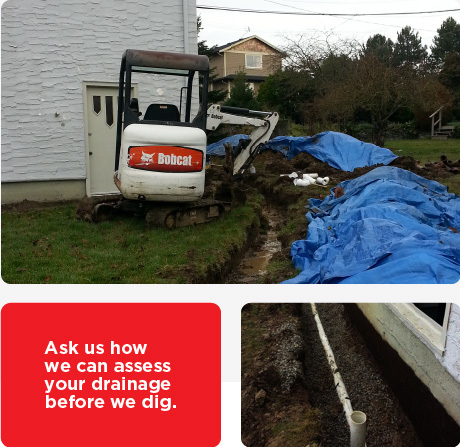 A well maintained perimeter drainage system will prevent water from penetrating your homes foundation. Over time sediment and debris can build up hampering the systems efficiency, causing water to penetrate your foundation and possible flooding of you lower levels. Homes built pre mid 1980’s are more susceptible to this as the pipes are made of clay sections that can separate and compromise their effectiveness. We use a specialized cameras to assess your sewer health and determine the appropriate action. Our team will repair or replace with minimal disruption to your yard and garden by using hand digging or small walking excavators.